I think this breaks the fourth wall. Or maybe the fifth. This is just fabulous! Can you give us a style card? Hair, top, skirt? Who needs men? They never stand still long enough to take a decent pic anyway. i have derendered a few who just had to stand in the wrong spot. There were none around in this shot though. Just for fun, the above scene from a different angle. 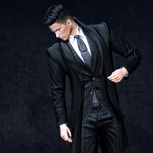 Vendetta for Hipster Men's Event, plus a new Bento head release from Lelutka. Feeling scandalous in this pic lol. Working on a new show. /me looks over, screams, swoons and falls down, wakes up, looks over and screams again. This was taken before I started fiddling with its sliders. I'd have posted an "after" shot, but, you know . . . the mods might object? Trying to make up my mind, so many choices! That happens pretty often with him. No idea what to say about this one. It's a picture. Hair: D!va - "Helen" - I checked on MP, but it's only sold in-world, so here's the link to D!va. Top: ISON - "yso tied shirt" in cream and that's the link to it in MP. Skirt: Sn@tch - I can't remember exactly what the name is, but I think it's "vinyl pencil skirt" I do remember that I snagged it at the last Gothic Garage Sale. I can't find it on MP, so this is the link to Sn@tch inworld. - It's called "Saskia PVC" if you're having trouble finding it. I thought that looked like D!va hair! The shirt was driving me nuts. I have not lusted after a pixel garment that much in a LONG time. It was a fairly long and slightly painful process (or maybe I just was REALLY "off" today) but I have a great new ManChic who is pretty stunning if you can say that for a guy. Romeo is free from altmura with group($50). You need to choose BUY from the vendor then Lindens, then choose pay and WITH GROUP TAG ON buy for $1. Not exactly intuitive. Altamura Omega applies are not appearing on the Marketplace for some reason and the link in the official step by step goes nowhere. So you have to purchase inworld. This is a FULL $5000 avatar. Shown here with 7 Deadly S[k]ins Ivar but he looks VERY good with the skin provided (really nice). PS. There is of course a JULIET but I haven't tried her yet. Adding a more finished look picture as I head off to dreamland. I am impressed! Changed again (because surely I'm not the only person who gets changed into something more suitable when I'm testing new dances?) I just picked up the L$1 dance from Move, and it's a good'un. Video here.